Recognizing the universal benefit of systemwide consistency, the Court applied the “means and manner” control test to Domino’s franchise system to determine whether Domino’s possessed the general right to control the relevant day-to-day activities of the franchisee’s employees. The Court’s application of the “means and manner” control test focused primarily on Domino’s comprehensive operations manual and other materials to evaluate the control, if any, Domino’s reserved over the “hiring, direction, supervision, discipline, discharge, and relevant day-to-day aspects of the workplace behavior of the franchisee’s employees.”2 Following a comprehensive review of these items, the Court ultimately found that no employment or agency relationship existed between Domino’s and its franchisee’s employee. Since Patterson, no court applying the “means and manner” control test has found an agency relationship to exist. See Vann v. Massage Envy Franchising LLC, 2015 U.S. Dist. LEXIS 1002, *20 (S.D. Cal. 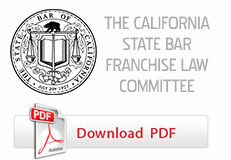 Jan. 5, 2015)(franchisor’s system-wide polices identified in its operations manual assisted in brand uniformity and did not show that the franchisor was a joint employer with its franchisees); De La Sol v. Xerox Corp., 2014 Cal. App. Unpub. LEXIS 6155, 15 (Cal. App. 2014)(contractual requirement that an authorized sales agent use Xerox parts in the service of Xerox machines does not amount to substantial control by Xerox for purposes of vicarious liability); Brunner v. Liautaud, 2015 U.S. Dist. LEXIS 46018, *16 (N.D. Ill. Apr. 8, 2015)(franchisor’s “hands on approach emphasizing uniformity and compliance does not support a determination that [the franchisor] is a joint-employer” with its franchisee); see also, Ambrose v. Avis Rent a Car Sys., 2014 U.S. Dist. LEXIS 170406, *13-14 (C.D. Cal. 2014)(court refused to adopt the means and manner control test for quasi-franchise business model). These post-Patterson rulings suggest that the application of the “means and manner” control test has made it nearly impossible for plaintiffs to successfully assert vicarious liability against franchisors. However, the U.S. District Court for the Southern District of California’s recent denial of a motion to dismiss in the case of Keller v. Narconon Fresh Start, 2015 U.S. Dist. LEXIS 53596 (S.D. Cal. Apr. 22, 2015), identifies a blueprint that plaintiffs may be able to follow in an attempt to further their agency claims. In September 2014, plaintiff Christopher Keller and his parents, Curtis and Linda Keller, filed suit for breach of contract and fraud against Narconon Fresh Start (“Fresh Start”), Association for Better Living and Education International (“ABLE”), Narconon International (“NI”), and Narconon Western United States (“NWUS”).3 The claims arise out of Christopher’s experience in a drug rehabilitation program owned and operated by Fresh Start. According to the complaint, a representative of Fresh Start made several false statements to the plaintiffs concerning the effectiveness of the drug rehabilitation program and the supervision that would be provided to Christopher while he attended the program. Relying upon these alleged representations, the plaintiffs paid a $33,000 program fee and enrolled Christopher in the program. Christopher ended up leaving the program early because, among other things, he did not feel safe and he believed that the staff was unfit to treat him. The Licensors moved to dismiss the complaint, arguing that the plaintiffs’ experience was with Fresh Start – a single licensee – and that the allegations in the complaint are insufficient to establish an agency relationship under the precedent identified in Patterson. Unlike the other post-Patterson cases identified above, the Keller lawsuit was initiated in its entirety after the Patterson ruling was announced by the California Supreme Court. This presumably provided the Keller attorneys with an opportunity to mold their complaint to avoid the same control deficiencies identified in Patterson. By thoroughly dissecting the operations manuals and then pleading each semblance of control reserved by the Licensors over Fresh Start in these documents, the Keller plaintiffs were able to overcome the Patterson plaintiff’s shortcomings and allege facts sufficient to support an agency relationship. In light of Keller, franchisees should be encouraged to dissect all of the franchise system materials in search of any language that identifies control by the franchisor. Presenting this language to the court in a vacuum may be enough to overcome the Patterson decision. Alternatively, franchisors must be even more vigilant in ensuring that their policies and procedures are limited to the protection of their brand and goodwill. Any suggestion that the franchisor is exceeding this limited control could provide fuel for future claims of vicarious liability. Patterson v. Domino's Pizza, LLC, 60 Cal. 4th 474 (Cal. 2014). The common “Narconon” name is reflective of a longstanding and famous drug rehabilitation and education program that uses the “secular technology” of L. Ron Hubbard to educate and treat addicts. (Defs.’ Memo of P’s & A’s ISO Mtn to Dismiss, p. 2.) Of course, Mr. Hubbard is also known for founding the Scientology religion. Defs.’ Memo. ISO Mtn to Dismiss, p. 3. Pltfs.’ Opp. To Mtn to Dismiss, p. 4 (the manuals are entitled “Running an Effective Narconon Center” and “Opening a Successful Narconon Center”). Keller v. Narconon Fresh Start, at *10.